Christoph Willibald Gluck: Overture "La rencontre imprevue"
Concerto turco nominato "Izia semaisi"
This innovative CD reminds us that Europe in the 1700s was intensely curious about Turkish culture, once hostilities between the West and the Ottoman Empire had finally ceased. Perhaps the most famous example of Turkish music influencing European classical music comes in the finale to Beethoven's Ninth Symphony. However, by that time, Turkish effects were already passé. A better example is offered by Mozart's Abduction from the Seraglio. The overture to that opera contains riotous percussion punctuations typical of Turkish janissary bands. To hear it played by Concerto Köln, a classical original instruments ensemble, and Sarband, a German-based group specializing in traditional Turkish music, is a joyously noisy treat. A few years back, Concerto Köln released award-winning CDs devoted to the music of Joseph Martin Kraus, who sometimes is called "The Swedish Mozart." Kraus makes a return appearance here with eight excerpts from his ballet Soliman II. In three of the excerpts, percussionists from Sarband join in to make the music sound even more exotic. Gluck's brief overture to the opera "La Recontre imprévue" (a.k.a "Der Pilger von Mekka") gets a similar treatment, as does Franz Xaver Süssmayr's wildly entertaining Sinfonia turchesca. 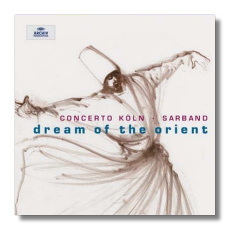 It was happy idea to have Sarband play traditional Turkish music elsewhere on this CD. Not only does this complement the European works, it allows the musicians to introduce their string and wind instruments to listeners. In some cases, the composers are known; in others, not. Hearing this, one is forced to confront one's prejudices, and the stereotype that Turkish music is nothing but wailing muezzins, and primitive flute and drum duets. If only prejudices against Islam were so easy to dispel! If only political dialogue could follow the musical dialogue begun so fascinatingly here! Stylistically, Concerto Köln and Sarband might be separated by more than the Strait of Bosphorus, but they've found a way to join together. In the booklet notes, Concerto Köln's director Werner Erhardt (no relation to the est guru, I am sure!) recounts how an idea became a meeting, then a collaboration, then a series of concerts, and now a CD. He also relates how his precise classical ensemble learned something about the joys of imprecision from a traditional group – a story repeated throughout musical history, perhaps, but never wasted in the telling. Dream of the Orient takes an interesting idea and brings it to fruition with inspiration. For fans of eighteenth-century classical music, it's a must.